Are you planning to spend your summer holiday in Croatia, together with your kids, and wondering how to provide them with a fun holiday that will be a lasting and cherished memory? One of the best ways to have fun is to spend a day at an aqua park. Most of them are located on the Adriatic coast – from Istria to Dalmatia, and are opened only during season (from May to September). This time we have singled out four aqua parks on the Adriatic which will provide you and your kids with an unforgettable and fun experience. The Čikat Aquapark, opened in 2015, is located on the island of Mali Lošinj. It is known as the first aqua park on a Croatian island. It has seven pools for adults and kids, but it also has restaurants, fast food courts, a fitness section and a massage section. You can check ticket prices, together with all other important information, on the aquapark's website. Despite its small surface, Dalmatia Aquapark located at the Solaris hotel complex offers a sufficient number of fun and interesting things to keep you and your kids entertained for an entire day. Water fortress called Aqua fortress, hydro massage pools, shallow pools for the youngest ones and the lazy river – 200 m long river with a slow downfall – are only some of the Aquapark's attractions. Bring your own food and drink or grab a bite to eat at one of the restaurants and bars at the park. The park has a designated parking lot. You can check ticket prices and other important information on the aquapark's website. Welcome to Aquacolors, the biggest aquapark in Croatia! This aquapark is located near the city of Poreč in Istria. Unlike Dalmatia Aquapark, the entertainment units are adapted to everyone – from toddlers to teenagers and parents. There are more than 13 water slides, a big pool mimicking a beach and a pool with little slides. Those who prefer the mainland have two sand sports courts and interesting and safe climbing sections which will thrill the little ones. Ticket prices and other important information can be found on the aquapark's website. 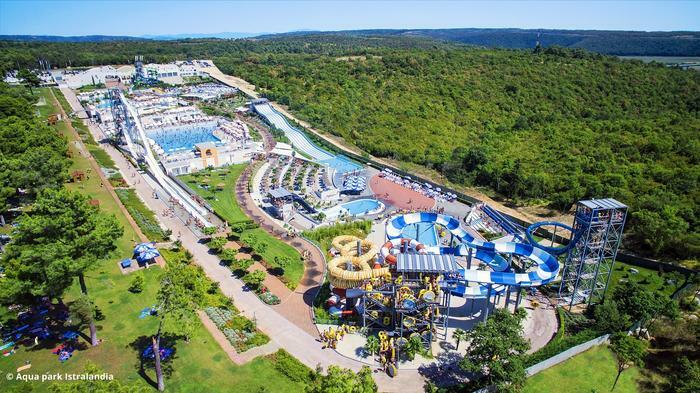 Another popular aquapark in Istria is Istralandia located near the little town of Nova Vas. 12 water slides with different themes, children's pools, hydro massage pools and pools with waves are some of the attractions at this interesting water park. For those in search of other types of fun, Istralandia offers various events: children's workshops, playpens, tournaments and recreational activities. Together with the aquapark, there are restaurants with different types of menus. When it comes to other things you might need, Istralandia has a gift shop, ATMs, an exchange office, medical emergency team and lockers to keep your things safe. You can check ticket prices and other information on the aquapark's website.